In 1947, my dad built a spectacular O scale model train layout for me to enjoy at Christmas (shown at right - to see larger photo, click here). It was a three-level platform with a sleek Lionel Hiawatha streamlined passenger set running on the bottom level. 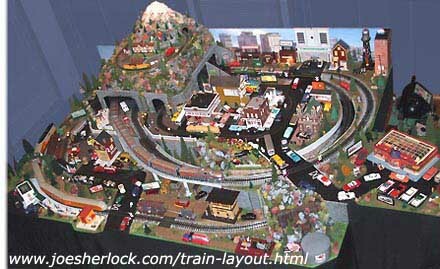 53 years later, in 2000, I built a three-level model train layout for my grandson to enjoy at Christmas. It, too, features a Lionel Hiawatha streamliner running the bottom level, just like the '47 layout. These web pages provide details of the 2000 layout, structures and equipment. My toy train layout uses mostly Pennsylvania Railroad engines and rolling stock. (My dad worked for the PRR for 42 years.) An O scale GG1 electric loco pulls a passenger set; a small PRR diesel switcher pulls freight cars. Many of the buildings and structures on this model train layout have been made from modified kits; the building names are reminicent of those in Philadelphia since that's where I grew up. Two O scale Philadelphia PTC trolleys run on the layout. An HO trolley runs near the top of the mountain. There are almost 400 people on the layout, most of them assembled and hand-painted by me. This model train layout has over 120 trees, countless bushes and shrubs and almost 100 cars, trucks and buses. This train layout uses a wood space frame construction. Overall dimensions of the layout are 84" x 120" with a 24" x 30" extension for the Lionel Hobby Shop. The tip of the mountain is 65" from the floor. The mountain and the 'hobby shop' extension both detach for storage. The train layout can then be flipped 90 degrees and rolled on 6 industrial casters which are attached to the back of the layout. The front of the model train layout is hinged and folds 180 degrees, so that the tilted-up unit can fit through doorways. Click here to see larger photos.